Ugly grey office chair, purple cabinet, melamine desk and of course, the clutter. Ugly! Need I say more? I was so excited when I found this desk on Kijiji for $75 and the best part was that the seller was including the oak office chair with it! The desk was pretty beat up. The top had some minor water damage, gouges and several dark markings. The opening at the front (where the chair sits) was very beat up along the inside edges where the chair had obviously been rubbing for years. To me, this spelled CHARACTER and I was all over this project. We sanded the surface of the desk. All of the rough edges (that were really worn/damaged) were sanded quite deep, so that they were rounded and safe. We didn’t want to catch our clothes on the splinters or worse yet, get a sliver. The only thing we had to do to the chair was dust it ~ and that rocks! Top is in rough shape. Lots of wear and tear. As mentioned above, we sanded the entire desk down and removed any splinters and sharp edges. We then gave the entire desk a coat of stain and several coats of urethane. I think I put two on the sides and back, 3 on the drawers and about 5 on the top for extra durability. We had the stain and urthane here, so the only cost was the original $75 and lots of “elbow grease”. You may notice that the handles on the top middle drawer are not original. A previous owners must have replaced them at some point. They are definitely more of a modern style, but they are oak (I think) and blend well with the piece. We left them as most people wouldn’t even notice and it does not really compromise the integrity of the piece. We are completely thrilled. The desk is huge! The top is 3 feet deep and 5 feet long. 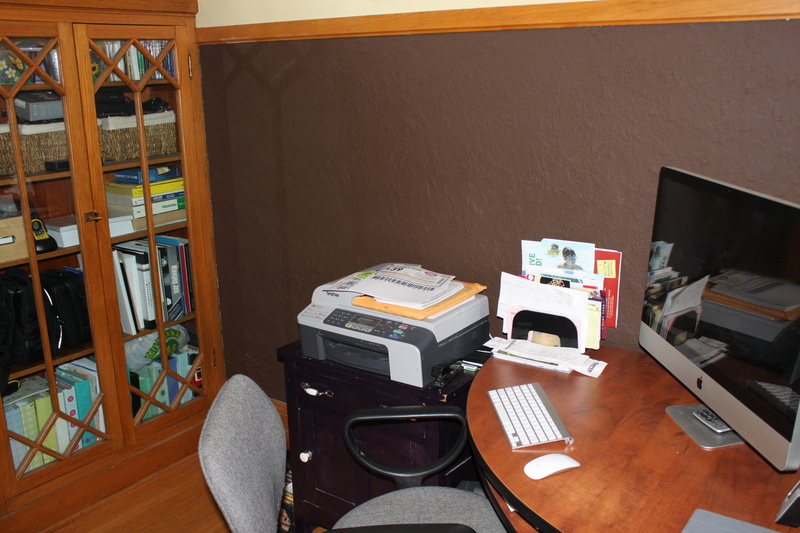 It provides enough space for the printer to sit on top of the desk as well as ample work space. 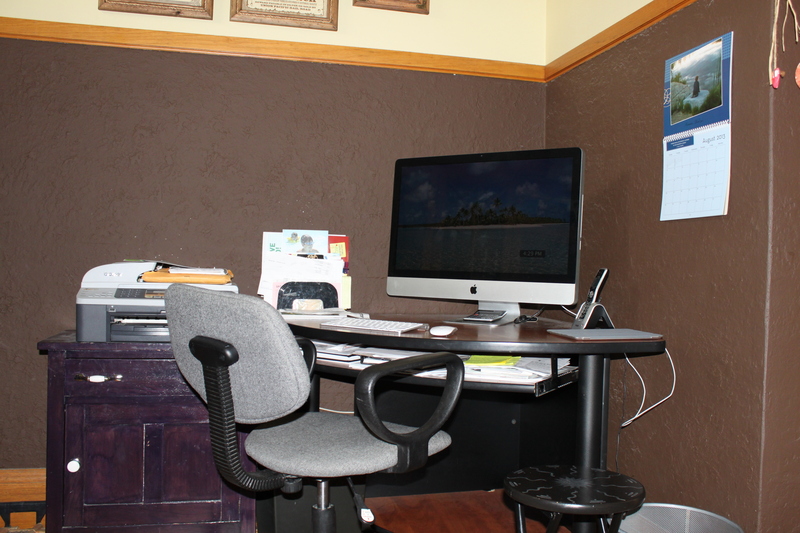 It also has two slide out work surfaces, so there is plenty of room to work. I love the drawer space for storage and the one on the left is actually a double drawer that holds files (it is just made to look like two single drawers). There is not much extra room, as we also have a love seat in the library for reading, watching movies or just hanging out. It is cozy, but there is still enough room to move in and out easily and gain access to all of the book shelves. Love it! Posted on August 23, 2013 by Cindy Roy •	This entry was posted in DIY and Upcycling, Home Decor and tagged antique desk, antique desk refinished, DIY projects, home decor, library make-over, oak desk, old teacher's desk, refinishing furntiure. Bookmark the permalink.